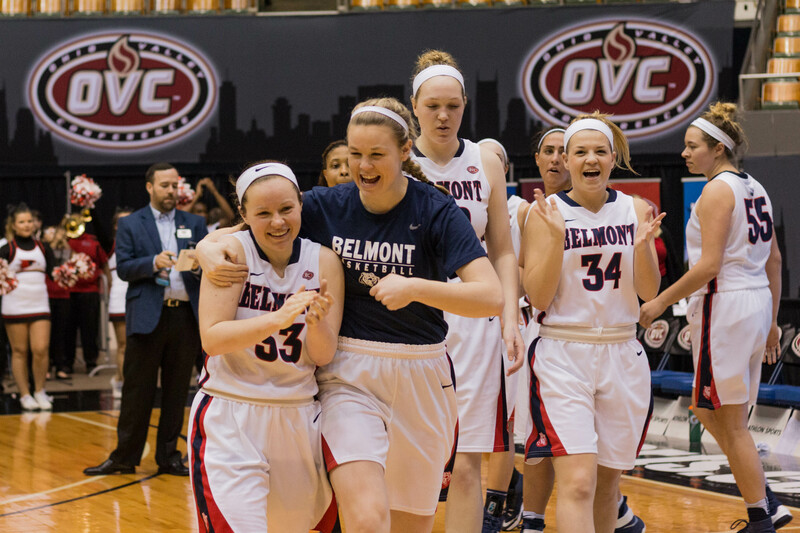 The Belmont Bruins defeated Southeast Missouri 74-59 in the first round of the Ohio Valley Conference Women’s Basketball Tournament at the Nashville Municipal Auditorium. Lauren Thompson led the Bruins with 16 points and six rebounds followed by Kylee Smith with 14 points. Bri Mitchell led Southeast Missouri with 32 points. The Bruins advanced to the next round of the tournament and will play Friday at 12:00 p.m.. The Bruins will play the winner of game 3, which will either be UT Martin or Austin Peay. The game will be broadcast on ESPN3 and the OVC Digital Network. This story will be updated after Thursday night’s game. The Belmont women’s basketball team will play UT Martin in the OVC championship semifinals Friday at 12 p.m.. UT Martin, the fourth seed in the tournament, defeated Austin Peay 59-43 Thursday afternoon and advanced to the semifinals. Below is the updated OVC Championship bracket.